NanoT was a project created for Microsoft Imagine Cup competition in 2014 by group of students. Our team was Unhandled Exceptions and we managed to achieve 3rd place in national finals and our project was also rewarded for the best graphical design. 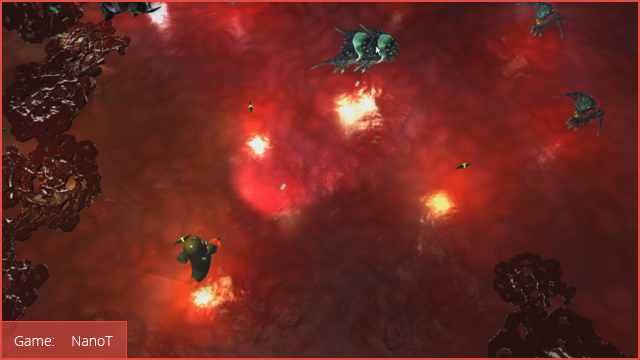 NanoT was a top-down shooter game, where player was given a task to cure human. Inside of it, was placed the last hope – result of working on mysterious project T – Nanorobot. By controlling it, player could use it’s weapons, skills and transformation ability to destroy bacteria, viruses and other harmful microorganisms. The game, that was presented in Imagine Cup was made in Unity3D engine and the main language that we’ve used was C#, but in April 2014, after Imagine Cup finals, we decided to use Unreal Engine 4 instead. We were working on this project till early January 2015, when we had to stop due to personal reasons. If you want, you can watch gameplay trailer on youtube (or here: download [13.5 MiB]). We also made short intro, which can be watched on youtube (or here: download [17.3 MiB]). For those, who like static pictures: here, is album with concepts made by Ewa Czub, enjoy! If watching it isn’t enough for you, here is Unity version of our game: download [360.4 MiB].